The classical open forehead lift surgery or coronal browlift involves placing an incision from ear to ear over the top of the head. The forehead skin & brows are moved upwards, the excess skin is removed in the scalp and the corrugator muscles near the inner eyebrows are removed. This was done primarily to reverse the aging changes associated with the constant stronger downward pull of muscles around the eyes (corrugator muscles) vs. the forehead muscle that elevates the eyebrows. The endoscopic brow approach was introduced in the mid-1990s to avoid complications associated with the coronal browlift by placing 3 to 5 less than a half inch incisions near the hairline & introducing endoscopic equipment through these incisions to perform the procedure. The initial operations had short term results because excess skin was not removed so surgeons began a variety of fixation maneuvers by screw, suture etc. to keep the brow elevated during the initial healing period until it was thought to adhere down in its new higher location. If you have a lot of excess forehead skin especially after the age of 50 or 60 it just will not shrink after the endoscopic approach so you need to have the open approach procedure. Thus the endoscopic approach is probably best for those with mild aging changes of the forehead. Since many of these patients have simultaneous blepharoplasty eyelid surgery some surgeons remove the main downward pulling muscles via the eyelid incision thereby forgoing browlift surgery in cases of mild brow drooping. 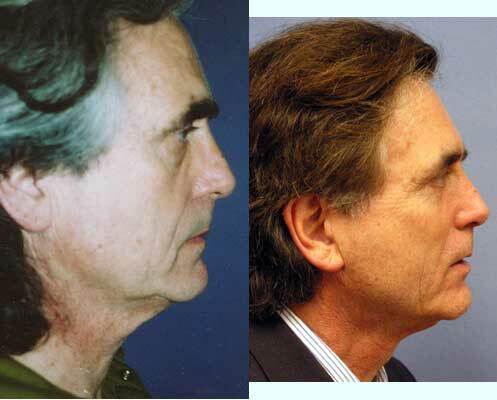 Foreheadplasty is recontouring of the forehead bone usually at the same time as a browlift. This has to be done via the ear to ear coronal incision in order to get adequate exposure. It is mostly done for reconstruction after accidents, feminization of the forehead and lowering of the hairline. If the brow drooping is severe enough to partially obstruct vision or reconstruction after traumatic injury is required the surgery is covered by health insurance. In the case of vision obstruction you will need to have visual field test results and photos submitted to your health insurance for preauthorization prior to surgery. 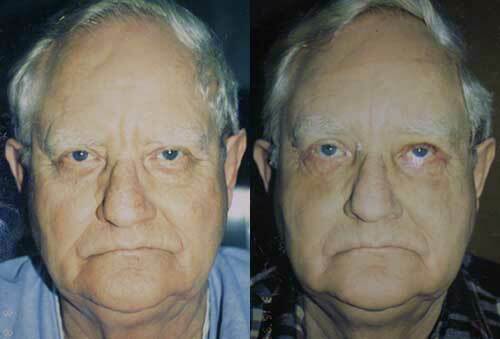 This 62 year old underwent open coronal browlift and upper and lower blepharoplasties. Before surgery her brow hung quite low and together with excess upper eyelid skin hampered her vision. In the before photo upper eyelid and brow skin touch her eyelashes. After surgery you can see her upper eyelid skin creases and her eyes are more open without the weight of the excess tissue from above. 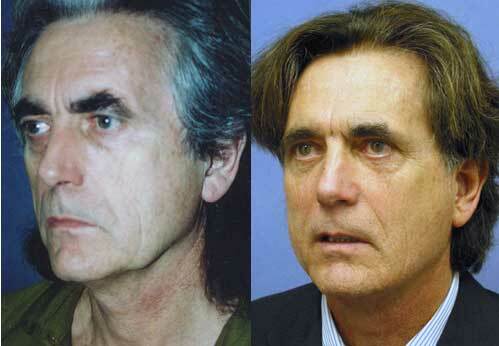 This 64 year old had upper blepharoplasties performed elsewhere without regard for his brow ptosis. That only made his brow hang lower as it was pulled down and he had to look through his eyebrow hairs. Luckily the previous surgeon did not take out too much skin so he was still able to close his eyes after an open coronal browlift. This patient had a lateral browlift in conjunction with removal of forehead skin between 2 forehead wrinkles as well as facelift and 4 eyelid blepharoplasty. About a 1cm vertical dimension section of skin was removed from the forehead. This type of brow lift was chosen because of his high frontal hairline that would be even higher with a classical open coronal browlift and lack of faith in endoscopic browlifts. Browlift surgery can enhance your appearance and your self confidence. Realistic expectations are important to be happy with any surgery. As each patient is an individual, different results can be expected in each patient. The nonsurgical alternatives are botox to weaken the muscle that pull the eyebrows downward and radiofrequency treatments that shrink the forehead skin. These modalities however are not effective when the degree of eyebrow drooping and forehead skin excess are severe. removal of the corrugator muscles via upper eyelid incisions. There are general risks common to all types of browlifts and specific risks for each type. If any browlift procedure is over done the eyebrow can be raised too high giving a constant startled look and/or an abnormally high frontal hairline. They all can result in incomplete removal of the corrugator muscles in which case eyebrow movement may be asymmetric and/or the results may be temporary as the remaining corrugator regenerates. Removal of the muscles via upper eyelid incisions has the highest risk of incomplete muscle removal. Any approach that dissects just below the temple area has a risk of damaging the nerve to the frontalis forehead muscle. If the nerve is damaged you temporarily or permanently lose the ability to raise the eyebrow. There can be hair loss or thinning anywhere there is a scalp incision. For a coronal incision that would be a line lacking hair over the top of the head. For endoscopic lift that would be 3 to 5 spots without hair on the scalp. This is minimized by beveling scalp incisions to prevent damage to hair follicles that normally are situated at a less than 90 degree angle to the forward skin surface. The only way to treat this complication is hairgrafting because if you just cut out the area lacking hair the new scar line will stretch & thicken becoming even more visible. The lateral forehead lift can stretch the eyebrows to the sides and distort their appearance if not done by an experienced surgeon. The direct forehead excision can result in widened visible scars if closed under tension. Skin excision directly above the eyebrows should not be done because it routinely causes highly visibly scars and/or destroys the normal gradual eyebrow edge making it abrupt. If performed in conjunction with upper blepharoplasties over resection of either the brow or eyelid skin can prevent closing of the eye, causing tearing and dry eyes. The benefits are a more youthful appearance, In cases where brow drooping contributes to visual field obstruction the surgery can improve vision. Being pleased with your new appearance can be a major incentive to changing your lifestyle, diet and exercise regularity in order to maintain your new look. The head should be kept elevated, no lying flat or head down position and you should sleep with your head on 2 pillows for 1 week. Ice compresses are applied for the first 24 hours. You can place 3 wet washcloths in the freezer & serially apply them. Alternatively, a bag of frozen peas can be used as a compress. No vigorous or strenuous physical activity are allowed for 2 weeks, even jogging at 1 week can cause a problem. Bruising, especially prominent around the eyes-black eyes, resolves within 2 to 3 weeks. Normal activities & work may usually be resumed within 2 weeks after the operation. You should not wear contact lenses the day of surgery and not begin wearing them again after surgery until specifically instructed to do so.